Author’s note: My personal reflection about the Sutherland Springs mass shooting was written before the horrific events at Stoneman Douglas High School and Santa Fe High School. The chorus of voices has only increased in amplitude regarding the calls to responsible action on firearm safety. While a larger debate continues in Washington, DC, I ask myself again: What can I do now as a medical provider to make a difference? The answer remains the same: Ask patients about firearm access and safety. Pledge today to hold yourself accountable, and encourage your colleagues to do the same regardless of political or ideological views. For a summary of further actions that ACP supports regarding firearm violence, see its position paper in Annals (1). After I hung up the phone, my thoughts immediately started racing about the details of the phone call. What local events were occurring … was it a mall? Could it be the air show that I had just visited yesterday with my wife and kids? Wait, did I hear 30-40 victims shot with high-velocity rounds … by one person? Is this really happening … again? While mass shootings have been occurring frequently across the nation, the tragedy in Sutherland Springs, Texas, penetrated my life in a more personal way. As a church-goer who lives in San Antonio, I was not only affected by the proximity of the shooting to my home in San Antonio but also the occurrence during the sanctity of a church service. I sensed an increased risk for myself and my family than ever before. Upon reporting to the hospital ICU ready to help with overflow patients, I received more grim news than the expectation of a mass casualty event: The majority of the victims died on scene due to the severity of their wounds and targeted nature of the shooter. While I am not easily disturbed by petty name-calling (“quacks”) and do not refute the severity of unnecessary patient deaths from medical errors, I am insulted by the inappropriate attempt to equate well-intentioned physicians (who save countless lives) with ill-intentioned criminals. In addition, another major difference is the response to harm from medical errors and firearm-related deaths. In its landmark report in 2000, “To Err is Human: Building a Safer Health System” (4), the Institute of Medicine outlined a comprehensive strategy for patient safety that led to a congressional hearing and fundamentally changed the long-term culture of patient safety in the medical community. There has been no analogous response to the ongoing public crisis of unnecessary firearm-related deaths. In fact, as outlined in that Annals article (3), more U.S. civilians have died from firearm violence between 2006 and 2016 than American military members of the Greatest Generation during World War II. We as the medical community must address this public health threat with a “comprehensive, multifaceted approach to reduce the burden of firearm-related injuries and deaths on individuals, families, communities, and society in general,” as stated by ACP’s position paper (1) from 2014. While considering the next step in my role as a physician in this challenging and complex issue, I immediately refocused on the famous first section of the Hippocratic Oath I swore upon receiving my medical degree: “First, do no harm.” We know that firearms are harmful because firearm injury is the second leading causing of death due to injury after motor vehicle crashes (5). But as a church-going gun-owner from the Midwest who is also a member of the military, father of young children, and believer in responsible gun ownership, how do I also balance the considerations of constitutional rights and societal safety? Although it is easier to do nothing on challenging and controversial topics, I knew it was time to do something. 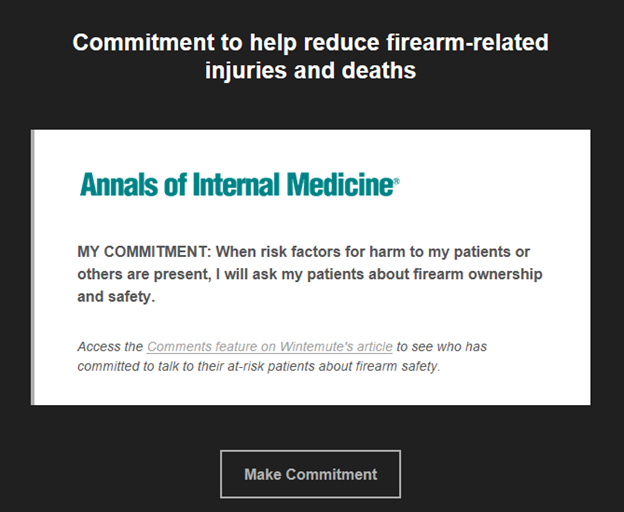 In a recent Annals article, emergency medicine physician Garen Wintemute offered a starting point for stopping firearm injury and death: make a commitment to ask patients about firearm ownership and safety when risk factors are present. He outlines this simple yet focused intervention that each of us as medical providers, regardless of our personal or political views, can do for the health of our patients: ask, counsel, and take action when imminent harm is present. If you need evidence behind those harmful risk factors (3) or educational material for yourself or patients, I encourage you to read more of Dr. Wintemute’s articles. By publicly posting your commitment online, you pledge your commitment to patient safety. While personal education and a professional commitment are the first steps, I encourage you to investigate additional ways (6) to further this conversation and get involved. As a medical community, let’s individually unify to make firearm injuries a preventable harm on the same level as medical errors. 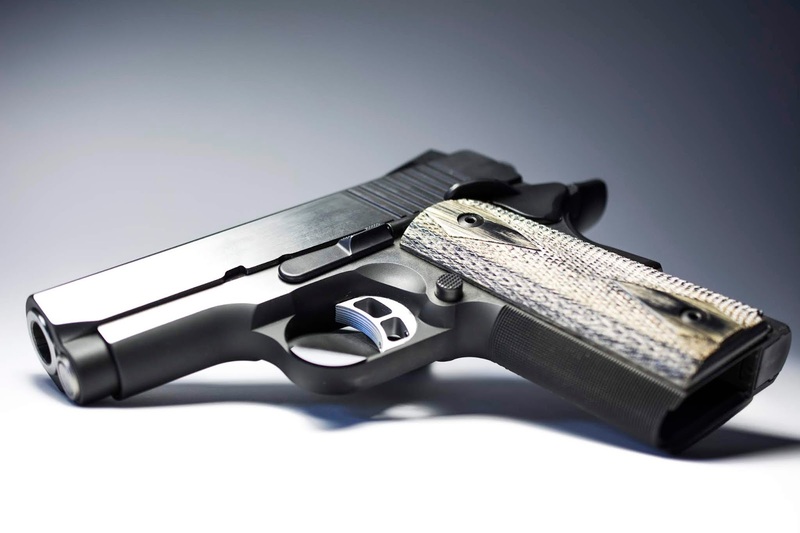 Burnett D. Quacks: doctors falsely claim guns are public health crisis. NRA America’s 1st Freedom [blog]. 24 October 2017. John Hunninghake, MD, is the Chair-Elect of the National ACP Council of Resident and Fellow Members (CRFM). 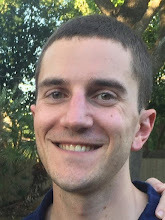 He is currently completing his second year as a pulmonary and critical care fellow at San Antonio Military Medical Center, where he also completed his residency. He graduated from medical school from the University of Kansas School of Medicine in 2013. His views are his own and do not reflect those of the U.S. Department of the Air Force nor the U.S. Department of Defense. Thanks for your enlightening article and service to our country!